Those who have read our blog and/or Journal, or watched our YouTube Channel, know that we like satire. Satire done well is refreshing because it pokes fun at the absurd. The Babylon Bee is an online source of regularly produced satirical news stories with titles like, “Woman Credits ‘Daniel Plan’ With Helping Her Shed 15 Years Of Reading Bible In Context”, “Report: Baptists’ Impressive Life Expectancy Linked To Casserole Consumption”, “Man Feeds The Hungry At All Times, Uses Food If Necessary” and many more. 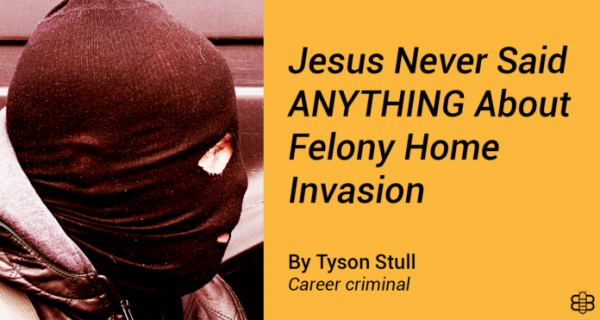 As I was thinking about this week’s blog, the “Bees” latest offering, “Jesus never said ANYTHING about felony home invasion!” appeared on my Facebook page. “Perfect,” thought I. The absurdity in their crosshairs this time is the very popular idea that if something isn’t explicitly stated in Scripture or explicitly stated it in a particular way, then the Bible doesn’t support that particular claim or doctrinal position. When we examine a doctrine like the Trinity, a doctrine that has no explicit Scriptural support, we must be sure we are dealing with the original text, not a translation. Surely you can see why from just this example. By the way, when I say that the doctrine of the Trinity has no explicit Scriptural support, I do not mean that various verses and terms cannot be marshaled to infer support for the doctrine. I mean that there isn’t a single verse that says, “And God is three in one,” or something like that. There is no verse that uses the term “Trinity.” The doctrine is a conclusion made by men about problems presented by the implications of several different passages. The fact that the term “Trinity” isn’t explicitly stated is not the same as having no “explicit Scriptural support.” Scripture explicitly teaches that there is only one true God. It explicitly tells us that the Father is God. It explicitly tells us that the Son is God and it explicitly tells us that the Holy Spirit is God. The doctrine of the Trinity explains, to the best of human ability, what the Bible teaches on the question of the nature of God. This does not mean that you cannot embrace it. Please, if the doctrine of the Trinity helps you draw closer to God, worship Him with greater passion and enjoy His presence, go ahead and believe it. What does Skip believe? Everyone wants to know. Skip believes that the so-called Trinitarian texts are ambiguous. Skip believes that the concept of the Trinity is derived from Hellenism and ideas found in Greek philosophy. Skip believes that no Jew in the first century, including those who wrote the New Testament, would have ever embraced a Trinitarian conclusion. But Skip believes that these authors (and Skip) think of the Messiah as “divine” within the semantic range of the word used in Scripture. Skip believes that Yeshua is the Jewish Messiah, that He is the Son of God and the Son of Man, that He is the chosen emissary of the Father, that He is the active agent and active agency of YHVH in creation, restoration and redemption. Skip knows that the dogma of the Trinity is an essential element of being a Christian and that those who desire to be called “Christian” will ipso facto be Trinitarians. And Skip finds that most of these people desire to worship the one true God and His Son, seek righteousness and wish to know the truth. Skip thinks of this entire effort as a journey which has not yet concluded. Skip thinks that what is most important is to know what the author meant when the text was written and that means there is a lot more work to do. 6) I don’t believe the Bible is without error. The Bible may be inspiring but is not inspired. It has little to say on human sexuality that is “of consequence,” a position which is along the lines of “Jesus never said…” claims, but goes a bit further. In this scenario, it doesn’t even matter if Jesus explicitly said anything, because the Bible is merely an inspirational book, not a communication from God to human beings about Himself, our relation to Him or our sinfulness and need of salvation. In this article you state that the Bible calls Jesus god. And the Bible calls the Holy Spirit god. Where are those versus found that state this?